deformities, but these approaches have significant drawbacks. Bone graft substitutes using bone morphogenetic proteins (BMPs) have been heralded as potential alternatives to reconstruction. BMP-based products, however, are associated with significant and potentially life-threatening side effects when used in the head and neck, and are exorbitantly priced. By comparison, oxysterols are products of cholesterol oxidation with proven osteoinductive capacity in mouse, rabbit, and human mesenchymal stem cells lines. Oxysterols are favorable alternatives or adjuncts to BMP therapy due to their low side effect profile and cost. As a cooperative of surgeons and scientists, we believe that oxysterols—by limiting the amount of BMP needed in a bone graft substitute paradigm—will advance the field of bone regeneration through cost reduction and improved care without any compromise in outcomes. Our preliminary data shows that Oxy133—a novel oxysterol robustly stimulates osteogenesis in vitro in rabbit MSCs. We propose to test the clinical relevance of this osteogenic activity with a series of in vivo studies. First we will reconstruct criticalsized rabbit calvarial defects by Oxy133-embedded collagen scaffolds. Using the Hedgehog (Hh) pathway inhibitor cyclopamine, we will then examine the role of Hh signaling in Oxy133-induced bone formation. We anticipate that Oxy133 will stimulate bone formation in vivo through activation of Hh pathway signaling. Finally, we anticipate the addition of autologous rabbit BMSCs will further enhance Oxy133-mediated bone regeneration in vivo. Findings from our proposed studies will support a new model for safe, quality, and cost-effective bone regeneration of craniofacial defects. 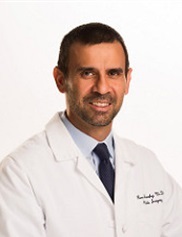 Reza Jarrahy, MD, FACS, FAAP is a board-certified plastic surgeon who has served on the full-time faculty of the David Geffen School of Medicine at UCLA since 2007. He specializes in craniofacial reconstructive surgery in children and adults, pediatric plastic surgery, and in cosmetic and surgery of the face and body. He is Co-Director of the UCLA Craniofacial Clinic, Co-Director of the UCLA Face Transplant Program, and Assistant Chief of Plastic Surgery at Olive View-UCLA Medical Center. Dr. Jarrahy earned his B.S. in Biology from Stanford University (1992) and his M.D. from SUNY Stony Brook (1996). He completed his plastic surgery residency and craniofacial surgery fellowship at UCLA. In addition to his clinical work, Dr. Jarrahy also directs a productive research laboratory which focus on tissue engineering research and clinical research relevant to craniofacial surgery and other fields in plastic surgery. He is the recipient of numerous research awards and grants and the author of many scientific publications, abstracts, and book chapters. He serves on the Board of the American Society of Maxillofacial Surgeons, contributing to national educational programs in craniofacial surgery. Dr. Jarrahy also regularly travels overseas to provide free reconstructive surgery to children in developing nations.